I’ve written numerous times about the importance of sharing an update as a way to communicate with your connections. My LinkedIn workshop attendees will tell you I mention it a bazillion times during the workshop, and they question my suggestion that they update at least once a day. One of the things I love about LinkedIn is the ability to learn about the connections in my community. By going to my homepage every morning and numerous times during the day, I can see with whom they’re connecting, articles they’re sharing, groups they’ve joined, jobs they’ve landed, and more. This can be time-consuming, so I narrow my search by type (see list below). 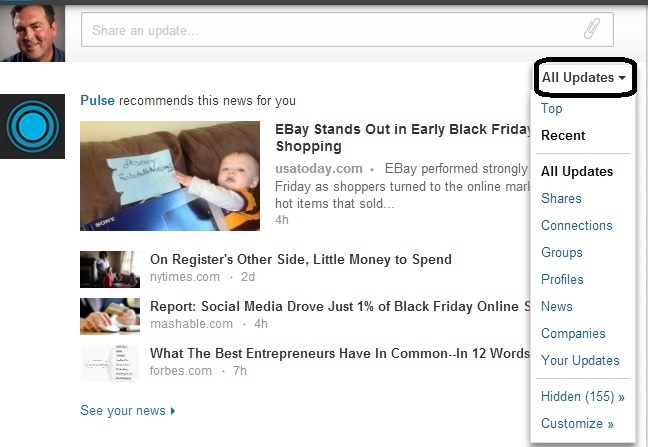 If you’re interested, like me, in focusing on certain types of updates, here’s how to do it. Click on “All Updates” just below the “Share an update” box. A drop-down menu will appear giving you many options for various types of updates to look at. For instance, if you’d like to know what changes are made to your connections’ profiles, simply choose “Profiles.” Let’s look at the various types of updates. All Updates. This is the default update setting but preferred by those who like variety…or don’t know about the “All Update” feature. Below are more specific update types. Shares. If it’s blog posts/photos/videos and more you’re interested in, select this type of update to discover what your connections have been sharing. Connections. Important for those of you who are interested in who your connections are connecting with. I find this useful if I recognize a second degree with whom I’d like to connect. Now I can get an introduction to my connection’s new contact. Groups. Who in your network has joined a group? Who’s started or contributed to a discussion? Because groups are so huge, you should stay on top of what your connections are doing in their groups. Profiles. Your connections might have landed a new job, made updates to their skills and specialties, recommended someone, posted a new photo (big these days), or celebrated a birthday. By they way, you can hide this activity and changes to your profile by going to Privacy & Settings > Turn on/off broadcast activity. News. This brings me to the channels I’m following and the comments people have made, whether they’re first or third degree connections. Oh, there’s an interesting article on emotional intelligence. I’ll be back, I’m going to read it. Companies. Curious about which companies your connections are following? This could be good fodder for discussion. “So, what’s the interest in BAE?” This is another activity you can hide if you don’t want certain connections (your boss) to know. Your Updates. This type of update is not about your connections, but it is one of my favorite features under All Updates, as I’m very forgetful. This allows me to see if or when I’ve shared a post of mine or some of my connections’. Perhaps I’ve made a statement of advice, or listed a quote. I would like to know this lest I share an identical post. My final comment on updates is the ability to customize what you want to see when you’re perusing your homepage or using the “All Updates” feature. Perhaps I’m not all that interested in what companies people are following. I can simply eliminate that update type from the list. This entry was posted in LinkedIn and tagged All Updates, Companies, connections, Groups, LinkedIn, News, Profile, Shares, Updates on December 1, 2013 by Things Career Related. I never knew that was there. Thanks. I did. At first I was only using it for checking on my updates. Now I check for shares or profile changes.